A while back I posted some images of a runner who transitioned to minimalist shoes which demonstrated an improvement in arch structure (the entire post can be seen here). It generated a lot of attention and page hits. Many of those against minimalist running shoes had of course said it was bogus. This particular case was an example of what we are now seeing published in the most recent literature on running either barefoot or in a minimalist shoe. Strength gains occur without a doubt, and with strength gains comes a structural change. This recent article demonstrated increase in strength of the abductor hallucis muscles through adaptions in a minimalist shoe (Elizabeth E. Miller, Katherine K. Whitcome, Daniel E. Lieberman, Heather L. Norton, Rachael E. Dyer, The effect of minimal shoes on arch structure and intrinsic foot muscle strength, Journal of Sport and Health Science, Volume 3, Issue 2, June 2014, Pages 74-85). Daniel Lieberman from Harvard has said it best, “How one runs probably is more important then what’s on their feet, but what is on ones feet may effect how they run”. This is my point exactly. Running shoes in my opinion are not much different in regards to preventing injury than the shirt on your back. The rate at which running injuries occur has not changed since the 1970s which is evidence that the current paradigm of treating these injuries or preventing is not working. This also includes the use of running shoes as we know them today (Yeung SS, Yeung EW, Gillespie LD. Interventions for preventing lower limb soft-tissue running injuries. Cochrane Database Syst Rev. 2011 Jul 6;(7)) If you are having issues with injuries etc, you may need to reset and go back to basics and learn how to run without relying in shoes and then find a shoe that “lets” you run. In continuing on with this particular case, here are the X-rays that everyone was asking for in their comments. I drew lines to help demonstrate the structural changes which occurred and what we typically look at when reading an X-ray in regards to angles and arch height. Red lines demonstrating the angulation of the calcaneaocuboid joint. 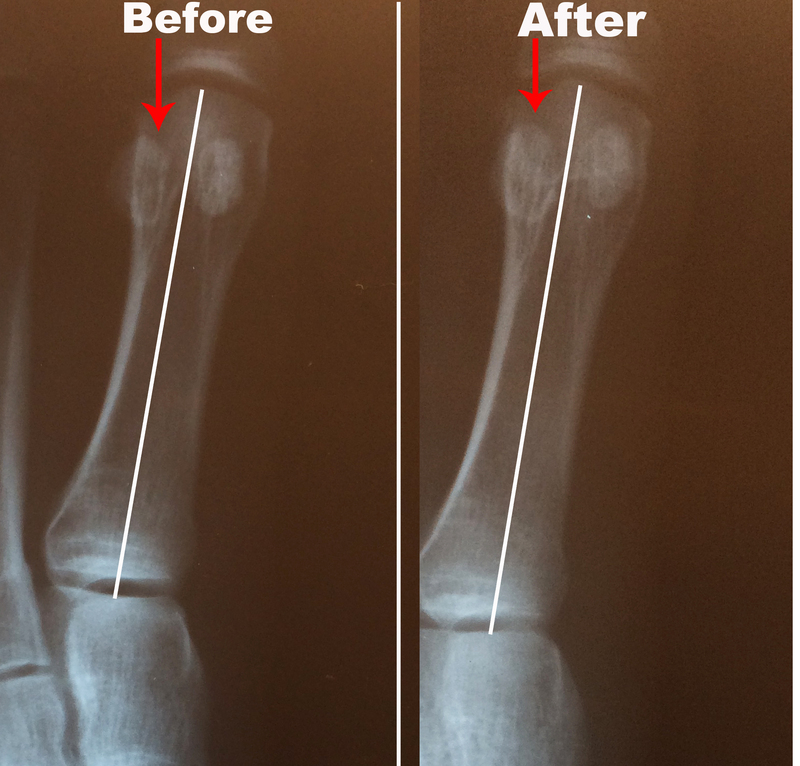 The reduction of the angle indicates improvement of the medial longitudinal arch (frontal plane). The red arrow is pointing to the fibular or medial sesamoid bone. 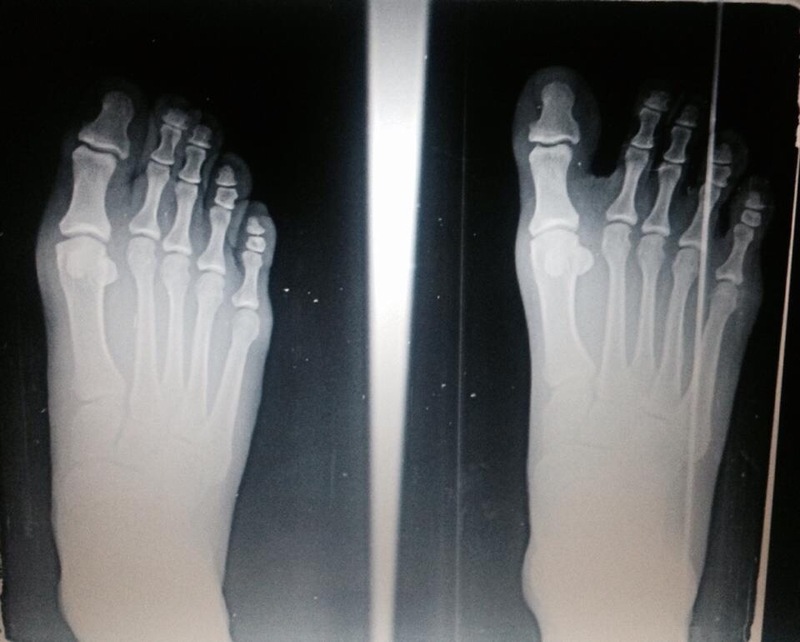 In the after picture it has not moved more central under the metatarsal head. The before picture shows it more in the 1st interspace then actually centered under the joint where it should be. The blow images were shared with me by podiatrist Dr. Emily Splichal. They demonstrate the effect of how a strong abductor hallucis muscle can pull the big toe into more of a medial and anatomically correct position. So as one can see, if you strengthen the abductor hallucis muscle it will help to reduce a bunion deformity where there is angulation of the big toe occurring in the opposite direction of the muscle’s force. Anecdotally we see this in those who have had bunions and have then transitioned to barefoot activities as well as running in minimalist shoes. This is contrary to the prior belief that wearing orthotics will help to prevent the formation of a bunion deformity, which by the way is also anecdotal. 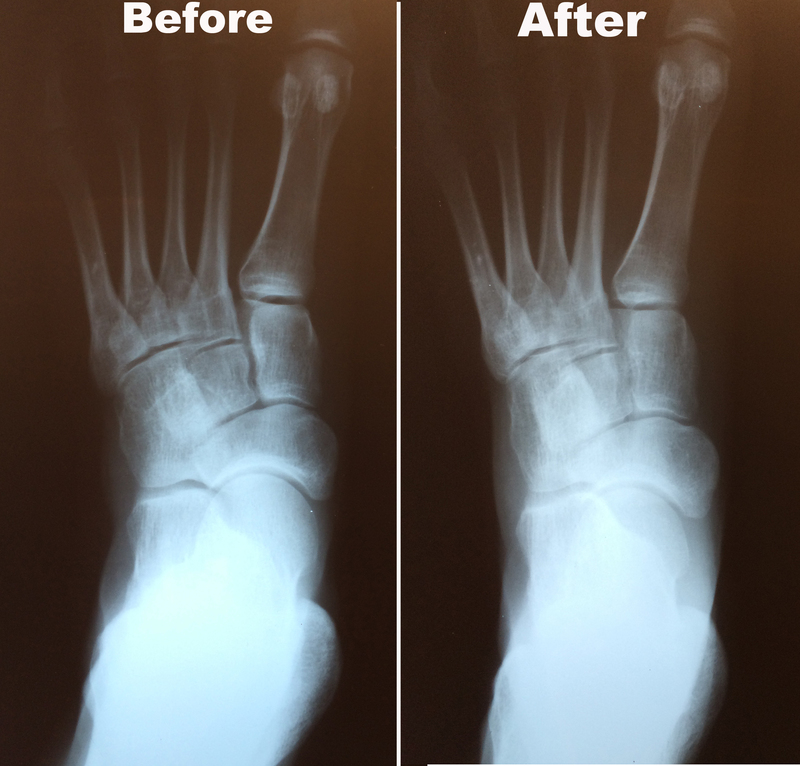 The premise for preventing bunion formation with orthotics comes from the idea that reducing pronation with an orthotic device can prevent hypermobility to the first metatarsal. Studies that demonstrate this fail to exist. You can read more about isolated strengthening of the abductor hallucis muscle from Dr. Splichal here. In summary, I am not saying that barefoot running will fix an injury or prevent one. The point we are trying to emphasize is that relying on a shoe to fix or prevent an injury is not supported in literature. There is no evidence based medicine to use running shoes to prevent or fix injuries and this has been demonstrated more then once in peer reviewed literature. RICHARDS CE, MAGIN PJ, CALLISTER R: Is your prescription of distance running shoes evidence-based? Br J Sports Med 43: 159, 2009. Rest, strengthening, and proper training patterns will fix the majority of running related injuries. I thought you were running a published study on this. I think your results are breathtaking and you’ve provided more then enough evidence for me. Yet, some people will just say that this isn’t peer reviewed evidence, or that the images could have been sourced from anywhere. Always enjoy your posts. Great stuff, keep it coming! I would be interested in your take on the product Correct Toes when looking to restore foot and especially abductor hallucis function. We are talking a lot of the impact of barefoot/minimalist running but don’t you think that living and walking barefoot/minimalist is even more important? I think both are best but it seems to me that bigger focus is given to running. Nice to see this measured change. I have many examples of structural change to the feet. I have increased two sizes in footwear since adopting barefoot technology footwear. You can also reverse ‘Morton’s toe’ by just changing your everyday footwear. @Matthias – You have an important point there. When you compare the amount of time you spend running to the amount of time spent in typical footwear throughout the day, you will certainly get most bang for your buck going either barefoot as much as possible and wearing casual barefoot technology (3mm sole and wide toe-box) when you’re not running. 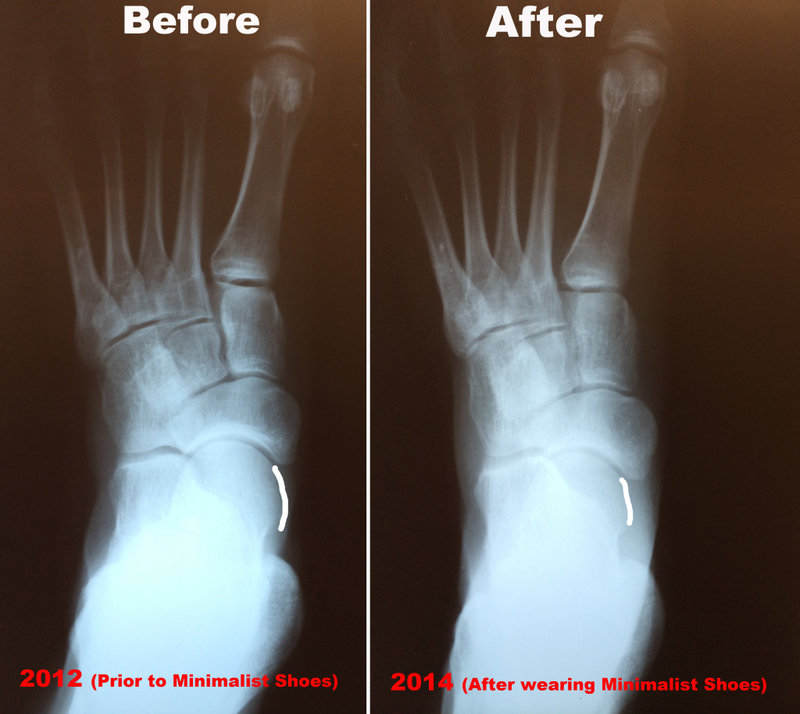 It’s great to see this x-rays and the changes it brings to running in minimalist shoes. Can I share this blog article on my website, eventually translate it into Dutch. Great content Doc! With these results I can definitely divert and change what I’ve been used to. Mind if I share this to my site doc? Wow! This content is so fascinating. Thanks a lot for sharing this. I’ve learned somehow. My brother will surely love this, he had the same situation. i have been walking in minimalist shoes and i have been barefoot (except winter) for 4 years now. my big toes still twist in on the 2nd joint (middle to end) what can i do about that and how long might it take to cjamge?